Size. How big is your dining room space? You should leave at least 42 to 48” between the edge of the table and the wall to allow guests to pass through, sit down and get up with ease. 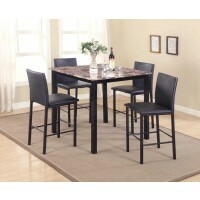 The width of the table should be of at least 36” to allow space for place settings and food. Start by measuring your room to determine the best size table for your space. Style. Your style, as well as the style of the space around your dining room are important in creating a fabulous space. You may like a rococo look, but if your dining room table will be an extension of your very contemporary kitchen, the styles may not match. Choose a style that matches your taste as well as the decor of the surrounding rooms. Finish. How often will you use the dining room should help you determine the type of finish you should select. If this is your everyday dining room table and it will be placed in the kitchen, chances are it will be used for a lot more than just eating. You’ll tend to pile up papers on it, kids will do their homework, you may work on it from time to time, so a more durable finish is key to avoid scratches and damage from wear and tear. If the dining room table is for your formal dining room and it will only be used occasionally, then a more delicate finish may work just fine. Shape. Often times, the shape of your room will determine the shape of your table. Rectangular tables are the most common because most rooms are rectangular, they allow for the most seats and they can be flexible if they allow for extensions. Round tables are great for smaller spaces. They allow for additional seats if you need to squeeze in more guests on a special occasion since they don’t have corners or legs to bump into and they allow enough space between guests. Square tables are becoming more and more common. One great feature about square tables is that they give a sense of intimacy by allowing the same distance between guests sitting on all ends of the table. Number of chairs. This goes hand in hand with size since you don’t want to overcrowd your dining room table. There is nothing more uncomfortable than bumping elbows with the guest sitting next to you, so allowing at least 2 feet of space for each guest is a good rule to go by. Of course, you may consider getting an extra chair or two for a special occasion if your table allows for them to be squeezed in. Type of seating. Individual chairs have been the seating of choice for centuries, but adding a bench on one or both sides of your table can be a fun addition. Transparent chairs are another great choice for a modern space since they can give the illusion of your space being larger than it is. With endless possibilities, knowing exactly what you want before you visit the store will guarantee that you’ll bring home a table that is right for you and that you’ll be happy to have loved ones gathered around it for years to come.